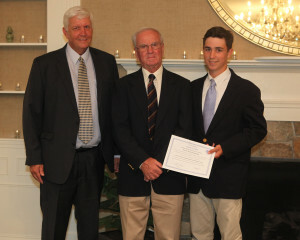 This year the Burke Fund selected Connor P. Pratt as the sixth Jim Tanner Scholar. Connor Pratt has been a caddy from Newport Country Club. He will enter University of New Hampshire this fall as a freshman, planning to concentrate in computer studies. Connor has an outstanding academic record at Rogers High School, and was captain of the Golf Team and the Indoor Track Team. Connor will receive the scholarship granted for four years requiring that a minimum grade average and full time status is maintained. Scholars of the Burke Fund are each required to work at a member golf course for a minimum of 2 years and include caddies, bag room attendants, pro shop and servers in the clubhouse. We encourage young men and women to consider working at Pawtucket Country Club or any of the RIGA member clubs. Previous Jim Tanner Scholars include John Coaty, Ryan Deighan, Justin Pires, Kaley Paulo and Terrance O’Neill. Next year will mark the tenth annual Jim Tanner Caddy Classic. We plan on many special events leading to the event planned for Monday July 11, 2016 with a 10:00 shotgun start. Many charity events do not make it to the ten year mark. Many thanks for the generous support of the Pawtucket Country Club Board of Directors and the many members that play and make donations. Donations this year included Bob Savoie, Frank Donehy, John O’Connor, Wannamoisett , Ledgemont, Metacomet, Agawam, Shelter Harbor, Wannumetonomy, Montaup, Alpine, Rhode Island, Segregansett, Crystal Lake, Triggs, Laurel Lane, Country View, Warwick and New England Country Clubs. Preparations for the tenth annual Jim Tanner Caddy Classic have already begun.